Recently I have learned from fellow blogger and spam poet Michelle that there is National Poetry Month in Canada. She has raised the bar for spam poets quite a bit with this post. (Voice from the future: Link is broken – web.archive-isize it yourself!) I am not sure if I can rise to the challenge. My spam queue is spilling over every day, but I have been choosy in the past weeks: I have only considered impolite, negative, and downright humiliating spam comments eligible for this poem – and these are rare. I have removed some words, such as kinda or a bit to make this so-called poetry more dense, and I have added a few comments which are strictly speaking not humiliations. But in one of many possible universes, they probably are. WordPress architects, in case you read this – I would like to request the following feature: Please allow for tagging spam for future poetry and for archiving spam already poetri-sized. I have evaluated spam comments for two months now for negative statements, copied all interesting phrases to a draft post – and deleted the comments afterwards. Now at the end of this mind-boggling creation process I came up with the idea of adding some quirky, but not necessarily negative comments. And I have run out of spam. And I have announced the poem already to the Canadian Community of Poets in a comment to Michelle’s blog. High expectations of fellow spam poets and spam poetry aficionados are lying heavy on me. I need to publish an incomplete poem. If I would have been able to archive and tag spams, I would have revisited re-evaluated them. Currently I have no other option than to time-travel back to uncover the deleted comments. Unfortunately, at an earlier point of time I am / will / have not been aware of my new idea and as soon as I would / will / have been arrived in the past I would / will have forgotten what I had been / will be / would have been searching for. Past few posts are out of track! come on! I miss your tremendous writings. I do not agree on everything you write. the posts are too brief for newbies. Could you please prolong them? Have you ever considered adding more than just your articles? execute an effective enquiry about his past record. you need to check the particular spelling on your posts. I find it very troublesome to inform you. I recently found what I hoped for before you know it at all. Quite unusual. Processing my spam comments happily, applying the same procedure as every months – I nearly failed the Turing Test again. 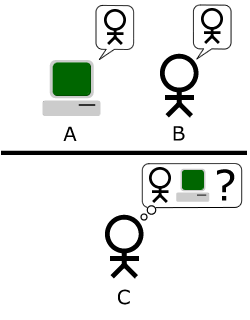 Turing Test (Wikimedia): Human or machine? The following was a spam (?) comment on my first post on politics and economy which was not exactly a funny and light post. The following time I read a blog, I hope that it doesnt disappoint me as much as this one. I imply, I do know it was my option to learn, however I truly thought youd have something interesting to say. All I hear is a bunch of whining about one thing that you could possibly fix if you werent too busy on the lookout for attention. I figured: Depending on the definition of whining and attention seeking I cannot deny the validity of this comment completely. I needed to do a Google-check this comment, and I learned that many bloggers have fallen for the same spam comment. But this post on Culture Digitally // Examining Contemporary Cultural Production provides an interesting explanation why we fail the Turing Test often: It is not machines becoming more human, it is us acting more like machines on web 2.0. This entry was posted in So-Called Art and tagged Art, Geek, Geek Collection, Negative, Poetry, Satire, Spam, Spam Poetry, Turing Test, Weird, Writing by elkement. Bookmark the permalink. I would recommend turning on two-factor authentication, BTW. Good job, Elke. I got exactly the same comment on the post on virtual dwelling (I think that most of my nasty comments are connecting with discussions of on-line participation, so Bert, these may be focused on tags and categories!). When I followed the nasty comment link stated above, the nastiness of it didn’t connect with the site so I thought it had to be a weird new form of spam. If spammers really want to imbed links in my blog to boost SEOs, then the kinder, more generous comments would probably stay un-trashed in my spam folder much longer. At this point in my life, the shaming comments people make don’t bother me that much, and I know that the best way to deal with them is to speak of the experience honestly, thus I put up a post earlier this morning, wondering if these nasty spams are connected to a hacker event that a friend warned me about (more info in the post). It’s best to deal with these things in open discussion, as I know there will be people who will be turned off blogging by crap like this. I’d rather encourage people to remain in the discussion. 🙂 I think I’ll go back to the post and update it with a link here. These attacks seem to be targeted against self-hosted wordpress.org installation, so I count on the wordpress.com team. Currently it is still easy to identify spam as such – however, as I replied to Bert below, I see a trend of increasing utilization of some level of bot-like automation by reasonable human bloggers and Twitter users I know. I conjecture that in the future there will be grey zone of automatically generated or distributed content sent from legitimate accounts. E.g. if I would run such a bot today that would collect geeky quotes by Douglas Adams etc. and reshare them an behalf of me – it would be hard to tell the difference to my “genuine social media sharing behavior”. Thanks a lot – this fully re-establishes my self-esteem as a whining and attention seeker blogger 🙂 You are right – isn’t any kind of art about attention seeking? I can relate! This post by Alex Brown – http://alexanderbrown.info/2013/01/13/real-comment-spam/ – motivated me to write my first spam poem. This spam comment was positive, and in a sense related to his post – similar to the issues I had with the rant spam comment on my post on politics. I looked at this post and other related ones in the blog. Thanks for the link. I don’t get it. Why focus on spam so much. I just delete them once a day. Never cared to read it. will try again with a real avatar. That’s a valid question of course: “Why focus on spam so much”. Probably I should take my obsession with spam to the next level and devote a full blog post to musing about that! Turning spam into lines that are not even quite poetry has no deeper meaning, but it allows my brain to relax from focused and serious research. As a more serious aside, I am fascinated by failing the Turing test and the reasons given in the article listed at the bottom. If I were a spammer, I’d make an algorythm focussing on tags and categories, and intertwine them in a message via google translate in a usefull sentence. So in 10 years time spam will be an entirely different problem, unless of course you use your ID-chip to authenticate. Thanks for the interesting comment, Bert! Probably it will be “normal” and “accepted” to rely heavily on bots and automation – in order to deal with millions of social networks you ought to participate in? It is sometimes hard to tell today where “professional online marketing” ends (e.g. scheduling your tweets) and where robot-like spamming starts. I wonder if there is a SciFi story dealing with spam of the future – similar to the way user-targeted advertising based on your iris had been anticipated in Minority Report.